Manchester United star Anthony Martial is fit Manchester United striker Anthony Martial has not picked up an injury while playing for France, according to recent reports. Manchester United striker Anthony Martial has not picked up an injury while playing for France, according to recent reports. The Frenchman reportedly picked up an injury in the last international friendly game against England at Wembley stadium but he has hinted that he is fit to play the upcoming Manchester United game against Watford. 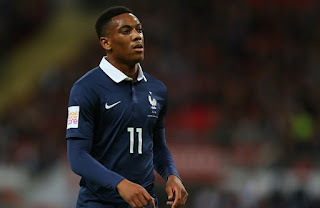 Martial was part of Didier Deschamps’ men last night which suffered a 2 – 0 defeat against the home side England. The 19-year-old was substituted after having a minor injury but he is expected to back for the coming Premier League fixture this weekend. Martial posts on Instagram after the game which hinted that he is fit as he thanked the fans for the emotional night and he did not even mention anything regarding his injury. However, the post has several comments about his injury and whether he will be available for the Watford trip or not. This could be a big news for the Red Devils fans as the striker is likely to be fit else if he could have faced the injury then Untied would have been in trouble as the Premier League outfit have only one striker Wayne Rooney who is out of form this season.